The parliamentary committee studying Bill S-6 heard Monday morning from the Yukon government and Yukon First Nations. 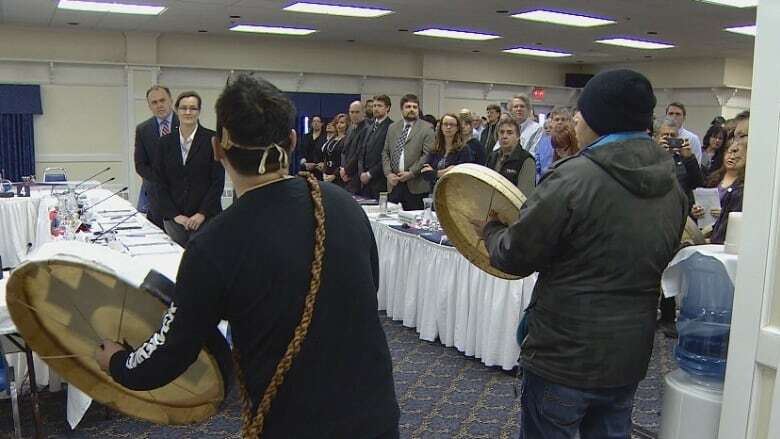 The parliamentary committee studying Bill S-6 got off to an unexpected start this morning when Kwanlin Dun drummers interrupted Premier Darrell Pasloski's opening statements with a welcome song. Committee chair Blake Richards tried to stop the drummers, but they responded by explaining that this is their traditional territory. People in the room stood to recognize the drummers and applauded. The committee then heard from the Yukon government and Yukon First Nations on Bill S-6, which proposes amendments to the Yukon Environmental and Socio-Economic Assessment Act (YESAA). Pasloski spoke first, repeating his message that S-6 will be good for the Yukon's economy and will improve environmental outcomes. The premier said Yukon First Nations have modern treaties that have taken years to establish and noted that YESAA is federal legislation, but he did offer an olive branch by suggesting a bilateral accord with First Nations and the Yukon government to resolve the outstanding issues. Yukon First Nations reacted positively to that suggestion, although they noted that consultation has not been adequate and they used words like: "lack of trust," "frustration," and "breach of the honour of the crown" during their speeches. The First Nations and the premier were questioned by Liberal and NDP members of Parliament, as well as by Yukon Conservative MP Ryan Leef. The First Nations told the committee YESAA is "no ordinary piece of legislation" and that it can't be changed like other federal laws. Chief Doris Bill of Kwanlin Dun First Nation summed up much of the First Nations' previous submissions when she said: "We will not allow this to proceed." The Yukon Chamber of Mines, Klondike Placer Miners' Association and the Yukon Environment and Socio-Economic Assessment Board will speak to the committee Monday afternoon.